Advertisement, information, and monitoring: Labels are indispensable in logistics and retail. Just like the whole packaging market, labels are continuously further developed by means of product and technical innovations. New trends and regulations, e.g. concerning recycling or RFID tags, influence this special market. Depending on characteristics of the packaging as well as the desired properties of the label, different types and materials are used. The analysts of Ceresana forecast an increase in European demand for paper and plastic labels in the upcoming eight years by 1.6% per year. Especially the manufacturers of in-mold labels (IML) as well as of shrink and stretch labels will be able to enjoy rising sales. IML are mainly made of standard plastics such as polypropylene (PP) and polyethylene-HDPE; but also hybrid plastics are especially manufactured for this purpose. If high-quality surfaces or a maximum display use are important for a product, IM labels can be the right choice: By embedding into the product, they are always protected and cannot be damaged during transportation nor during another step in the logistics chain. 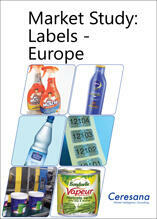 IM labels and packaging material can be made from the same plastics which enables a complete and smooth recycling. Shrink and stretch labels can offer unique shapes and print motives on very large spaces. Therefore, they become more and more popular, especially in the segments food, beverages, and cosmetics & pharma. The researchers of Ceresana expect the demand for shrink and stretch labels throughout Europe to increase by 3.3% per year. Chapter 4 provides profiles of the largest manufacturers of labels, clearly arranged according to contact details, turnover, profit, product range, production sites, profile summary, products, and applications. In-depth profiles of 63 manufacturers are provided, including Amcor Ltd., Avery Dennison Corp, CCL Label, Inc., Constantia Flexibles Group GmbH, Coveris Holdings S.A., Dow Corning Corporation, Huhtamaki Oyj, Mondi plc, Multi Packaging Solutions International Limited, R. R. Donnelley & Sons Company, UPM Raflatac, and Zebra Technologies Corp.